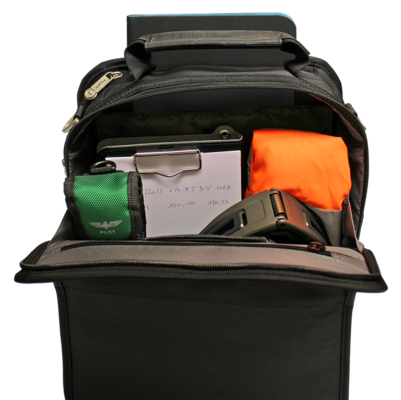 Since electronic devices such as tablets and smart phones have become indispensable in the world of aviation, we have customized our pilot case the PILOT EFB as the new “Electronic Flight Bag” precisely to fulfill these requirements. With its many pockets, this beautifully shaped, multi-purpose bag is ideal for everyday use. The bag is made of durable 1680 nylon, is well padded, and features a sturdy protective frame including a strap with metal eyelets and padded shoulder. In the main compartment you have space for headset, kneeboard etc. and an additional tablet compartment enables quick access without having to open the main compartment. A business card pocket and a further zipped pocket round out the options. 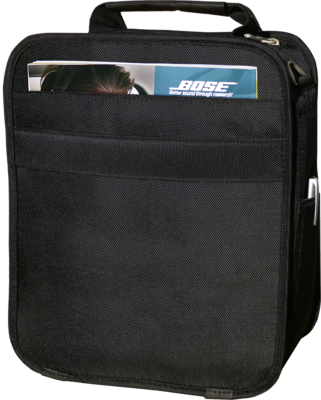 The two side pockets are ideal for pens, fuel tester, flash lights and other miscellaneous things. On the front you have a quick access pocket for cards, pockets for inserting pens and cell phone, key holder, credit card slots, and a mesh compartment for charging cables. In the back of the bag there is a pocket for maps or magazines and a trolley strap.